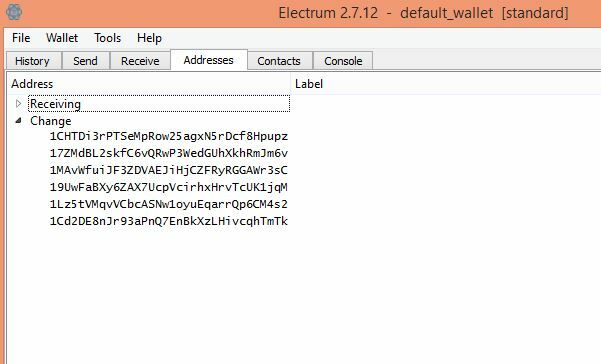 I am bit confused with the change label that is inside Electrum Wallet . Can I receive bitcoin if i give this address which are under change label? What is the difference between Receiving and Change Label Address? Receiving addresses are addresses generated specifically for sharing with people to send payments to you. Change addresses are generated by your wallet automatically when you send funds to someone else. To understand how change addresses work, consider this example. Say you received 0.1 BTC once, and 0.2 BTC another time. Now you have two UTXOs (unspent transaction outputs) to use to send to someone else. Now you want to send 0.25 BTC to someone. You have to use both of your outputs to have enough to send, but then you have 0.05 too much. You can't partially spend UTXOs, so what you have to do is make a transaction that spends both the 0.1 BTC UTXO and the 0.2 BTC UTXO, and sends 0.25 to the receiver and 0.05 back to yourself in a new address called the 'change' address. You should not be giving addresses from the 'change' section out to other people. Use receiving addresses for receiving, and let your wallet program automatically handle change addresses.